Rovio came out with a Halloween-themed Angry Birds six days ago and a million people have already played it. Games are the most popular apps on Apple's App Store, and, if Rovio keeps scoring hits, more people may end up playing games on their iPhone than on their game consoles. Even a cash-in like Angry Birds Halloween, which adds holiday-themed levels to the already popular game format, shot to #1 on the App Store charts in the U.K. and the U.S. in just 24 hours. Also interesting to note is that Angry Birds Halloween is the first title that was published by Rovio itself instead of using Chillingo, which was recently acquired by EA for a cool $20 million. 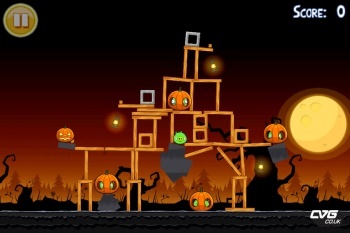 "We're delighted to see such fantastic reception for Angry Birds Halloween," said Mikael Hed, CEO of Rovio. "We intend to continue creating more and more quality products and updates, and keep exceeding the expectations of our fans worldwide." The Finnish developer Rovio is certainly the darling of the iOS game industry right now. The team is working on updates to Angry Birds for other platforms such as Android, Symbian^3, Palm WebOS and the Nokia N900. It's true that the company could probably keep milking the Angry Birds franchise but I'm interested in seeing Rovio develop something new to push the boundaries of what the handheld computer market can do. Preferably that's not a game called Angry Cats.